Topical retinoids thin the stratum corneum, and they have been associated with sun sensitivity. Instruct patients about sun protection. Also see Sunscreens and Photoprotection. Inflammatory bowel diseases (IBDs) have also been controversially linked to isotretinoin use. A number of case reports have linked isotretinoin with the onset of IBD, with a wide variety of severity of acne, dose of isotretinoin, and duration of treatment prior to the development of IBD. Subsequent case-control and cohort studies had conflicting results, with some suggesting no association between isotretinoin and IBD and others suggesting an association between isotretinoin and ulcerative colitis but not Crohn disease [62, 63, 64, 65] Finally, a 2016 large meta-analysis, indexing more than 9 million cases to reduce effects of selection bias and confounding factors, showed isotretinoin is not associated with an increased risk of Crohn disease or ulcerative colitis. A US Food and Drug Administration(FDA)–mandated registry is now in place for all individuals prescribing, dispensing, or taking isotretinoin. For more information on this registry, see iPLEDGE. This registry aims to further decrease the risk of pregnancy and other unwanted and potentially dangerous adverse effects during a course of isotretinoin therapy. While using isotretinoin, the patient is considered at high risk for abnormal healing and the development of excessive granulation tissue following procedures. Many dermatologists delay elective procedures, such as dermabrasion or laser resurfacing (eg, with carbon dioxide laser or erbium:YAG laser), for up to 1 year after completion of therapy. In December 2014, the FDA approved Bellafill, the first dermal filler indicated for acne scarring. Bellafill is a bovine collagen dermal filler. If the patient is feeling depressed while taking isotretinoin, refer him or her to a specialist for help. Diet therapy has been suggested. Fulton et al performed a study on chocolate, having teenage patients with acne consume 1 bar of chocolate each day. Some of the patients improved and some worsened, but the vast majority were unchanged. This study helped decrease the emphasis on diet as a causal factor in acne vulgaris. However, investigators always returned to the diet question. 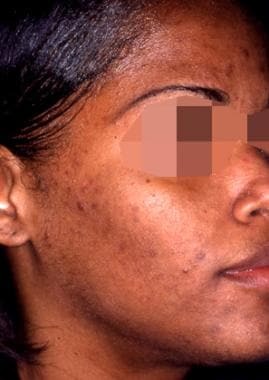 Data suggest that the westernization of certain Native American populations and the related consumption of unhealthy "junk" foods (eg, potato chips, soft drinks) has had a negative impact on general and skin health, resulting in acne flares. Skim milk, compared with full-fat milk, has been found to have a positive association with acne, especially in teenagers and young adults. 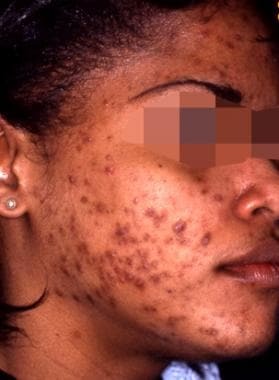 [73, 74] Causation was not able to be drawn from the case control studies, but the mechanism involving hormonal constituents of the skim milk has been postulated.  . Whey protein is a commonly used supplement that has been suggested to worsen acne and should be discontinued if flaring of the condition is associated with its use.